Most of us assume that if our business has a domain name and a website, “www.yourcompany.com”, that we are the legal owner of the domain name, “yourcompany.com” right? Well, maybe…. Recently a new client came to us to redesign his website. However, when we investigated the registration of the domain name, we discovered he was not the legal owner of his domain — his past web designer was! 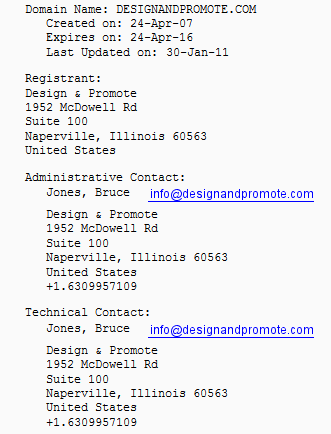 That’s because his web designer’s name was listed as the official “registrant” with the domain name. Our client was shocked, but unfortunately, this is a situation we have encountered many times before. Whois is the legal owner of your domain name? The question of domain name ownership isn’t always clear cut. Just because you are operating the website does not mean that you are the domain owner in a legal sense. So who is? In actuality, the domain owner is the person (or company) that registered the domain on your behalf. Many times, this is not the business owner, but rather someone the owner hired to create the website. So if your domain name was registered by your web developer or graphic designer, they may well be considered the “legal owner” of your domain if they are listed as the domain’s “registrant”. It’s important to confirm that your site is registered to your company or the company owner. Otherwise, the one who is registered and is considered the “legal owner” of the site, could cause problems for you later on. You can check whether or not your domain is registered to you on the website http://whois.domaintools.com. Whosis offers an easy, domain owner lookup to determine the registrant of your site. It is also a handy site to see what domain names are available, in case you need to find another one. You will need to make an account, but it is free. Once inside, simply put your domain name in the dialogue box and you will be able to view your whois record of your site, including the most important entry under “Registrant” and “Administrative Contact”. If you are listed there, all is well. If not…. We have included a screenshot of our whois of our domain as an example. What do you do if you are NOT the legal owner of your domain name? If you are not the name listed under “registrant”, hopefully, you recognize the name that is! And, hopefully you can identify them as the person who registered the domain name for you. Another hope is that you are still on good terms with the person who set up the domain name ownership for you. Most web developers, designers, etc. who regularly register domain ownership know that their client’s name should be in the registration, not their own. However, others may just not realize the legal ramifications of their actions. In trying to register the website on your behalf, they may have just unknowingly put in their own contact information without any ulterior motive. In this case, they would probably cooperate if asked to change the domain name registration over to your name. A disreputable web developer, however, could have registered incorrectly on purpose, either to hold you hostage to their fee structure, or to make it difficult for you to switch vendors. They may not cooperate with you, in which case, you need to take action. The main goal is to get your domain name registration changed by the registrar. Now a registrar cannot cancel, suspend or transfer a domain name without consent of the registrant or a court order. So, if you check your domain name registration and find that you are not the registered party, you must ask the registrant on file to relinquish their domain name ownership. If they refuse, you will need to contact ICANN (the Internet Corporation for Assigned Names and Numbers) and settle the manner using the Uniform Dispute Resolution Policy (UDRP). ICANN is responsible for coordinating many functions of the internet including the DNS (Domain name system), IP (internet protocol), addresses, codes (gTLD and ccTLD), space allocation, protocol identifier assignment, and root server system and top-level domain management. In 1999, in response to rising claims of this “cybersquatting” and “abusive or bad faith” registrations, ICANN formed the UDRP specifically to settle such domain name registration issues. About 17,000 complaints have been filed under the UDRP since. The UDRP has a quick, affordable resolution process in place for those who need it which begins by filing a complaint with an approved dispute resolution provider. A list of approved providers that can help you regain domain name ownership is available here. In order to settle a cybersquatting complaint, the real owner or owner of the “trademark” must prove several things: 1) that they have a legally recognized name that is identical or near identical to the domain name; 2) that the registrant on file has no legitimate rights to the domain name; and 3) there has been some evidence of bad faith abuse. UDRP disputes are settled by mutual agreement, court action or voluntary arbitration and according to ICANN statistics, the majority of proceedings resolve in disposition of the domain name back to the owner. In some cases, there may also be an administrative contact—someone that has been authorized to change the registrant name. Many times this is the web developer, because it is common for them to be the authorized, responsible party for the maintenance of the website content and administration. Also, in the development phase, it is often easier for the web developer to be the administrative contact because he can temporarily host the domain on his own site or in another place before it goes live. Regardless of how much you trust them, it makes sense to ensure that nobody has the power to be the legal registrant except you. It is akin to giving your friend Bob the title to your car for safekeeping, even though you are driving it yourself. If Bob ever needs a few bucks, he can sell the car, and the fact that you have been driving it for the past year makes no difference at all. Bob holds the title. At Design & Promote, we are experts in the sale and registration of domain names, and you can be assured your site will be registered directly to you. If you are looking to establish a domain name or are experiencing problems with your domain name ownership, contact us for help.